I'd like to tell you about a project we're unveiling at DAR.fm which will change radio by making it net friendly. Internally we call it Project Friendship, an homage to the resurgent animated series My Little Pony (more on that a bit later). The internet has cultivated a short McNugget-size media appetite yet radio shows are still serving 7-course meals with one to three hour shows. Rarely does one see links to interesting radio bits on Facebook or Twitter. Project Friendship makes it possible to share clips. 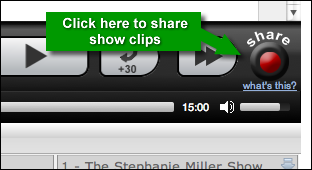 As people listen to shows on DAR.fm they can click the Share button and select a short segment to share with others. The clip will be uploaded to YouTube along with a description they provide. For the first time it's as easy to share a radio clip as it is a web page, picture or video clip. Here's a video of how it works. Show hosts are already using the Share button to post to interviews with politicians or other famous people or assemble 'best of' clips of their show. Project Friendship is designed to attract new radio fans and reinvigorate old fans by teasing them with shots of the most interesting radio happening every day. You can browse and listen to the clips at RadioShots.com. It's a great way to explore the amazing talent on radio. As for My Little Pony: Friendship is Magic, you can read all about it on Wikipedia or find out more and view clips here. Be careful because you may just become a bronie.